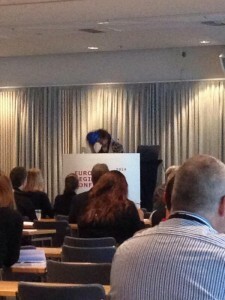 European registrars Conference 2014: Be Prepared! An accident won’t arrive with a bell on its neck. A little tired we started into the second day. The decision had to be made between „Valuation and Insurance“ and „Be Prepared“. Well, I felt not prepared after going to bed at 2 a.m., so I chose „be prepared“. The first presentation „Disaster Relief / AIC-CERT“ was divided in two parts, one about the idea and the training by Julie Bakke, Chief Registrar at the Museum of Fine Arts in Houston/USA and one they called „Steve’s Reality Show“ from Steve Pine, Senior Conservator for Decorative Arts at the Museum of Fine Arts in Houston/USA. After Hurricane Katrina hit New Orleans in 2005 it became apparent that the biggest problem in saving collections is not that there are too few people who are willing to help nor is it that there is too few expertise, the problem was that there was no form of organization that brings those two much needed components together. Therefore the American Institute for Conservation developed AIC-CERT (American Institute for Conservation – Collections Emergency Response Team). It is a group of volunteers consisting of conservators and collections specialists that will offer their knowledge in case of emergency – via phone, email or on-site. An emergency team in the way the AIC-CERT sees it consists normally of 4 people: 1 team leader, 2 people in the field and 1 logistics coordinator. Somehow registrars and collection managers seem to be a perfect fit for the logistics coordinator, because they are often responsible for their institution’s disaster plan already. They can also be good fits for the Incident Command Post. The training of the AIC-CERT isn’t purely theoretical. They do mock disasters in their training. They set up a scenario (category 3 hurricane in the museum, fire in the library due to a short circuit…) and the training team has to go through it to learn what to do and when. Steve showed pictures of the work that was done by AIC-CERT members together with artists and other volunteers to save the artworks of an artist’s colony and the costumes and props of the Martha Graham Dance Company (http://afrnyc.org/emergency-response-martha-graham-dance-company). Toilet paper instead of Japanese paper helped to dry pictures before mold could set in. Window screens were used as drying racks. An empty industrial hall as „field hospital“ for artworks and props… It was impressive to see how the professional knowledge of conservators and the spirit of improvisation resulted in saving thousands of artworks. The next session confronted us with another registrar’s nightmare: „Fire at the Museum“. Adina Ekbergh, Security Manager of the Museum of Ethnography in Stockholm/Sweden reported the incidents of this black day very calmly but vividly. When the smoke detector in the cold storage room went off they immediately evacuated the museum and the fire brigade arrived 7 minutes later. Unfortunately, smoke had infected the storage rooms in the vicinity of the cold storage room and the fire sprinklers did their work for 13 minutes, soaking the artifacts stored there. Fortunately, Adina was on site and immediately entitled to coordinate everything that was necessary by upper management. When the fire fighters had everything under control all doors were opened to let the smoke out and staff members guarded the doors. Most staff members waited on site to go back into the building to help with recovery. But unfortunately, the forensic investigation couldn’t be completed on that day and the building was sealed at midnight. The investigation continued the next day. Needless to say, the museum staff couldn’t begin with the treatment of the wet artifacts before the forensic investigation was completed. Precious time passed, and as a collection of feather, fur and leather artifacts was affected, the 24 hours that passed before staff could begin with recovery were enough for mold to set in. As soon as they could enter, the recovery began. They decided to freeze everything that was infected. From Thursday to Saturday every staff member helped with the treatment. At first they worked without protective equipment because there weren’t enough masks and gloves on site. Shopping for this equipment was one of the first tasks! Always have enough protective equipment at hand, because one can be sure that everybody wants to help but health of staff members should come first! Adina put it this way: we regard ourselves as professionals working with items, not as people. Therefore we often forget to consider health risks. If someone offers help, don’t say no. Don’t underestimate how disasters are physically, mentally and emotionally exhausting. Don’t be afraid to ask for help. No items should stand on the floor! Write a diary of what happened when in the incident – you forget! Have good connections to officials like fire brigade and police – establish them before something happens. Train your staff for disasters. The reason for the fire was identified as high voltage in a sensor of cold storage room. Pondering about the safety of our own collections we left for coffee break.